This is the second week of our CSF (community supported fishing). Last week was Black Cod, this week, Ling Cod and Rock Fish (red snapper). Craig and I talked this morning about how we were going to prepare the fish and side dishes. 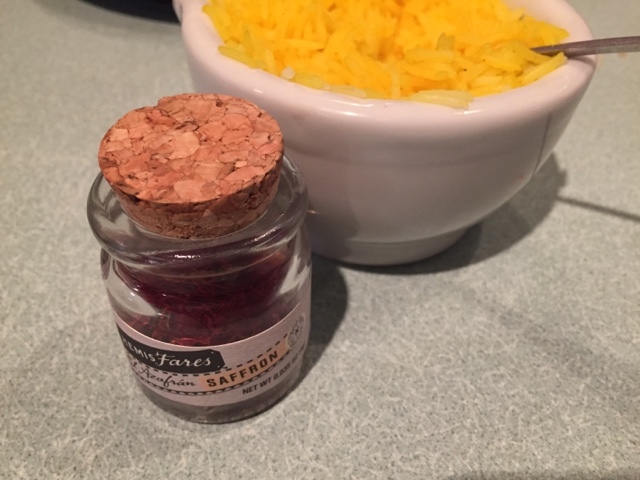 I was pretty set on the cucumber feta salad, and when I mentioned green onion rice, he said, maybe I should make traditional Persian rice with saffron. Any time he offers to cook, I'm just fine with that. When we picked up our fish today, we noticed that both fish combined, we at least 2 meals. So while we had planned for tonight's dinner, we quickly planned a dinner for tomorrow. Back to tonight’s dinner, when I heard we were getting Ling Cod, I immediately thought of an Asian marinade. 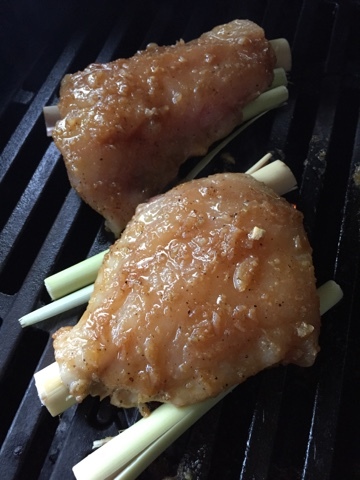 Garlic, Ginger Lemongrass marinade. So dinner tonight was a team effort. 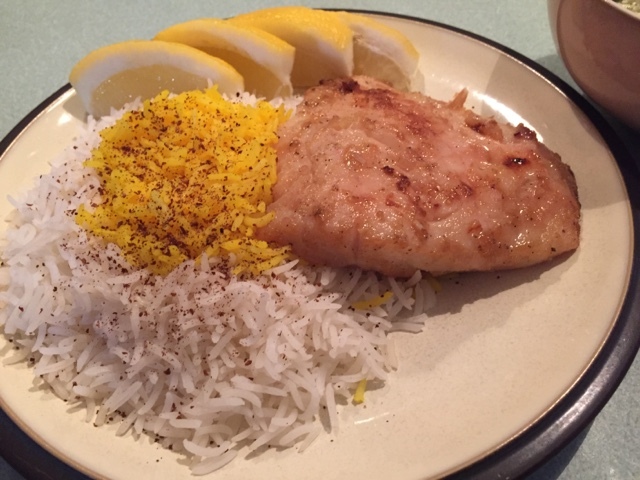 Craig did his traditional Persian rice with saffron and I made Cucumber Feta salad and the marinate for the fish. 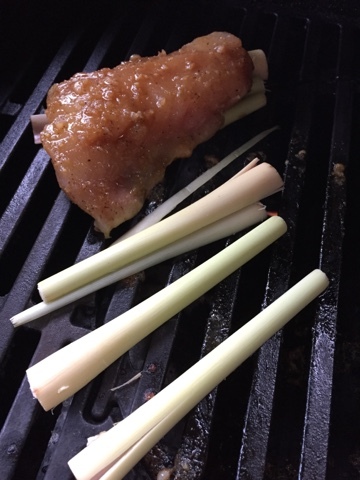 If you haven’t used lemongrass before, this is what you do for this recipe: Peel outer layer of lemongrass. Cut off top third of stalk, then cut off root end of stalk; discard. Thinly slice rest of stalk crosswise, and then finely mince it. It should smell lemony! Peel and finely mince the ginger and garlic. Finely minced the pepper (if you like a milder flavor, begin by slicing pepper in half and removing seeds before mincing). I have done all this mincing of ginger, garlic and pepper by hand, or the short way in my mini food processor. Suit yourself. In a small bowl or measuring cup, stir together lemongrass, ginger, garlic, pepper, sugar, fish sauce, soy sauce, oil and rice vinegar. Place fish in marinade, and let set for 15-20 minutes. Drizzle a little of the marinade on top of the fish. 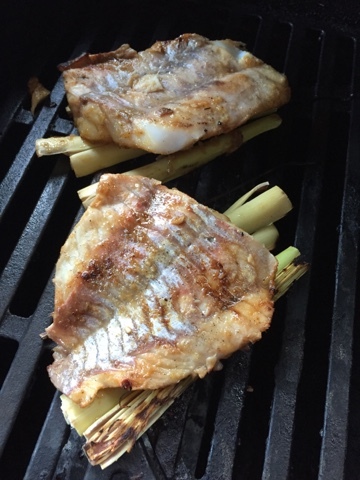 Pull fish out and place on lemongrass, slices in half and placed on the hot grill. Grill for 3-5 minutes, until fish is firm. 1. 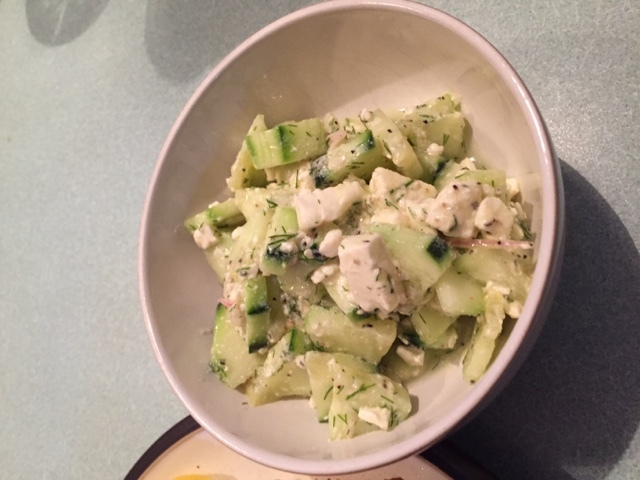 Place the cucumber pieces in a colander, mix with a light sprinkling salt, and let drain 30 minutes to an hour, shaking the colander from time to time. 2. Crumble the feta into a bowl and mash together with the olive oil, lemon juice, water, and a few turns of black pepper. 3. Mix in the cucumbers, onions, and herbs. Taste, and add more salt if desired. I have very well loved analyzing your weblog!!! Your before and afters are first-rate! you probably did a tremendous process, and IKEA ought to use your kitchen for instance of how beautiful a kitchen should look. severely! They need to use you. top notch job. whilst we picked up our fish these days, we noticed that each fish combined, we as a minimum 2 food. I'm working at Out of Home Advertising in Visakhapatnam So whilst we had planned for this night's dinner, we fast deliberate a dinner for day after today. lower back to tonight’s dinner, after I heard we were getting Ling Cod, I immediately thought of an Asian marinade. Garlic, Ginger Lemongrass marinade. So dinner tonight become a team attempt. 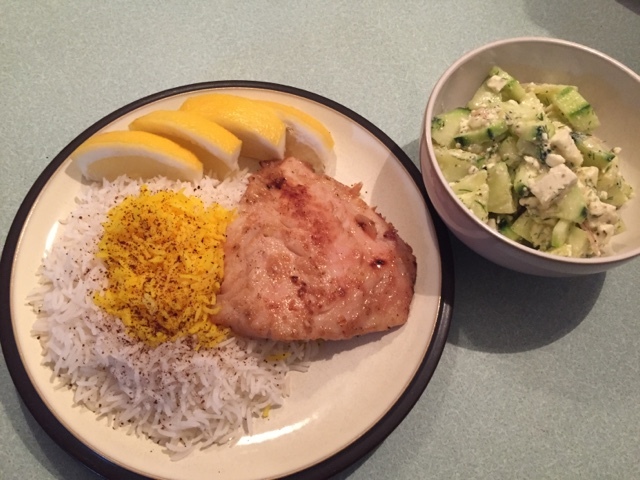 Craig did his conventional Persian rice with saffron and i made Cucumber Feta salad and the marinate for the fish.